Part I: Foundations of Successful Trading. The Invention of a Commodity Trader. Chapter 1: The History and Theory of Classical Charting Principles. My Perspective of the Principles. Three Limitations of the Principles. Part II: Characteristics of a Successful Trading Plan. Chapter 2: Building a Trading Plan. 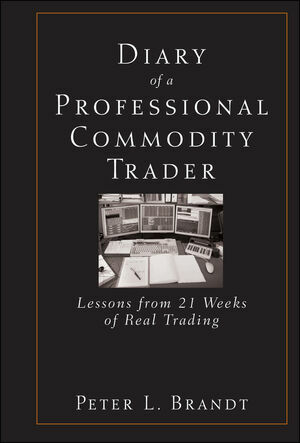 Chapter 3: Identifying the Trades and the Talk. Vocabulary of the Factor Trading Plan. Chapter 4: Ideal Chart Patterns. Reversal H&S Pattern in Copper. Reversal Rising Wedge in AUD/USD. Continuation Wedge and Reversal Failure Top in Soybean Oil. Reversal Triangle Bottom in Sugar. Continuation and Pyramid Patterns in USD/CAD. Continuation H&S Pattern in the Russell 1000 Index. Continuation Rectangle in Kansas City Wheat. Continuation Rectangle and Pyramid Triangle in Crude Oil. Continuation H&S Top in the Dow Utilities. Continuation Triangle and Reversal M Top and Flag in the EUR/USD. H&S Reversal Top, a Continuation Pattern, and Two Pyramid Patterns in the GBP/JPY. A Reversal Symmetrical Triangle in the AUD/JPY. Two Continuation Patterns in GBP/CHF. A Triangle and Running Wedge in Sugar. An H&S Bottom in Apple Computer. A Major Continuation H&S and Symmetrical Triangle in Gold. A Series of Bullish Patterns in Copper. A Failed Ascending Triangle in the USD/CAD Crossrate. A 12-Week Rectangle in the Dow Jones Transport Index. A Rare Horn in Brent Sea Oil. An H&S Bottom Launches the 2009 Bull Market in the S&Ps. Chapter 5: How the Factor Trading Plan Works. Chapter 6: Three Case Studies Using the Factor Trading Plan. A Remarkable Technical Event in the Dow Jones. Chapter 7: Characteristics of a Successful Trader. Intimate Knowledge of Trading Signals. Analysis of Self and of the Trading Plan. Part III: A Five-month Trading Diary: Let the Journey Begin. Sticking to the Plan in Choppy Markets. Relying on Classical Charting Principles. Chapter 13: Analysis of Trading Performance. How the Trading Plan Performed. How the Plan (and the Trader) Evolved. Summary: Best Practices Going Forward. Chapter 14: The Best Dressed List. A 7-Month Double Bottom in AUD/USD. A 14-Month Coil and 9-Month Descending Triangle in EUR/CHF. A 6-Month Wedge in EUR/USD. A 16-Week Horn in GBP/USD. A 4-Month Head and Shoulders in Bottom NZD/USD. A 6-Month Ascending Triangle in Failure USD/CAD. An 8-month Head and Shoulders Bottom in the S&Ps. A 14-Month Symmetrical Triangle in Sugar. A 7-month Triangle in Gold. A Series of Continuation Patterns in Copper. A Head and Shoulders Bottom in Crude Oil. Appendix A: Factor Trading Plan Signals. Appendix B: Quick Reference to Charts.